I’ve been aware of this one for a while and would like to investigate it further. Some say it is bigger than asbestos by far, with glyphosatye found in beers imbibed at the Munich beer festival. Meanwhile a new study has found that glyphosate disrupts the biome at ‘safe’ levels of application. The study found disrupting effects on sexual development, genes and beneficial gut bacteria in rats. In 2015 the International Agency for Research on Cancer (IARC), a WHO agency, judged glyphosate to be a “probable human carcinogen”. However, US and European regulators subsequently deemed it acceptable for use, a move campaigners condemned because of regulators’ use of secret industry papers identical to application from pesticide maker [that is, the EU’s food safety watchdog report included pages lifted from the Monsanto submission] and experts with alleged ties to Monsanto. Monsanto, recently merged with Bayer, has been verballing the research institute, the Ramazzini Institute, saying it is an activist organisation with an (unspecified) agenda. However, Ramazzini worked with Bologna University, the Italian National Health Institute, George Washington State University and the Icahn School of Medicine. Of course, we need a longer study while we continue to use the stuff hither and yon. 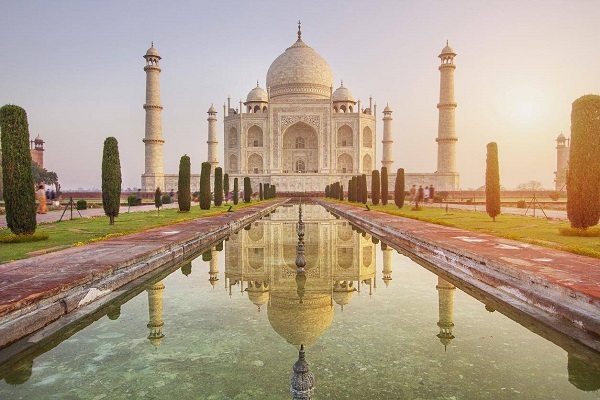 The Taj Mahal is turning brown and green, and the Uttar Pradesh state government doesn’t seem to care, according to the Supreme Court, which has instructed the government to get foreign expertise to fix it. Problem is, it was built by a Muslim and incorporates and expands on design traditions of Persian and earlier Mughal architecture. One BJP politician said last year that it was built by traitors and was a “blot on Indian culture”. That was after it was left out of a government tourism booklet by a government run by a Hindu hardliner. One problem is the nearby Yamuna River – thought to be India’s most polluted – that attracts insects which excrete waste onto the monument’s walls. There are also a large number of factories in the area, which the court has ordered shut down at times. Currently workers use fuller’s earth – a mud paste that absorbs dirt, grease and animal excrement – to remove the discolouration, but it is not entirely effective, and the monument doesn’t look good with scaffolding around it. 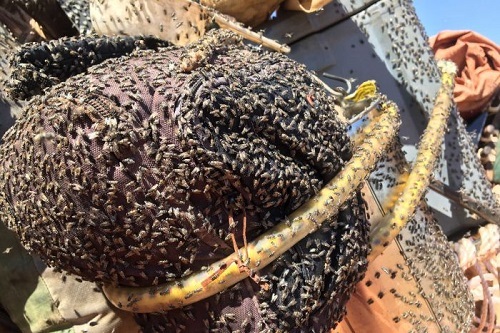 Andrew Harper from the Outback Camel Company, travelling through the western Simpson Desert, reckons he’s never seen the flies this bad in his 22 years traversing the outback. 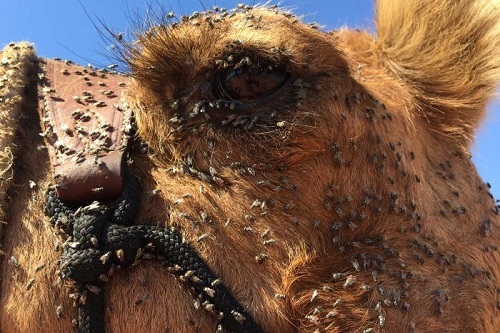 Apparently flies don’t bother camels, which may be just as well. Three out of four flies are female. They need protein to reproduce. The males are looking for moisture. Maybe there is a way of making a meal of them – they seem to be available in significant quantity. Thanks to John Davidson for the link. Somewhere between the Australian’s triumphalist interpretation of Newspoll’s static two-party preferred result laced with a personal approval boost to the prime minister and Fairfax’s skittish Ipsos-fuelled Coalition rebuff probably lies the current state of play. Newspoll showed Labor steady at 51-49 ahead in TPP terns, but a noticeable tick upwards in Malcolm Turnbull’s approval ratings. He’s now 39-50 satisfied-dissatisfied, rather than 36-53, whereas Shorten is 33-55, down a point. In terms of better PM, Shorten looked like closing on Turnbull, but now he’s 46-32 rather than 38-35. I didn’t make too much of the other questions asked except that the LNP is clearly seen as the better economic manager, which seems to be baked into the Australian psyche. In the Fairfax-Ipsos poll Labor’s lead blew out to 54-46, which stretches belief. 57% thought the extra funds should be used for paying off government debt, with 39% favouring tax cuts. Essential came in at 52-48 for Labor, closing from 53-47. 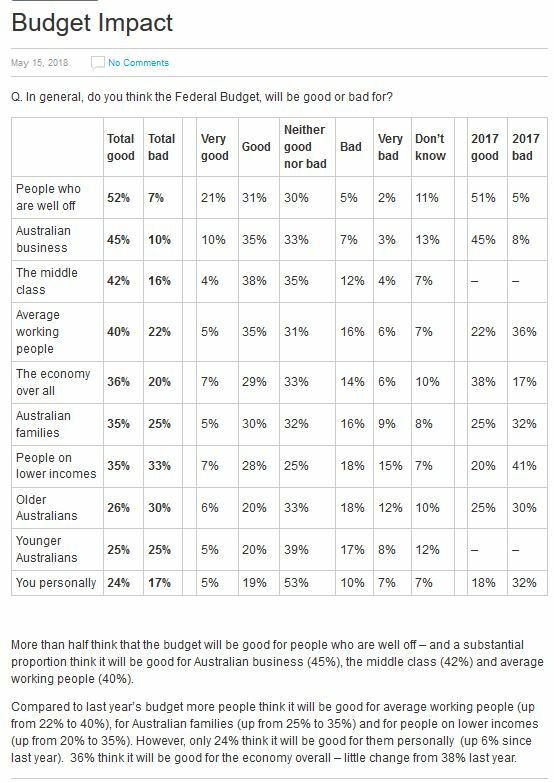 Fairfax-Ipsos and Newspoll essentially found that the Budget was favoured most by people who benefit most, who need it least and are least likely to vote for Labor. We didn’t need polls to tell us that. The tax cut, miserable though it was, and the promise of more to come, keeps the LNP government in the game of economic management where they have a natural advantage. Tonight I hope to take a look in more detail at Chris Bowen’s Budget reply speech at the National Press Club. .., keeps the LNP government in the game of economic management where they have a natural advantage. A natural advantage, how so ? To clarify, most of us have reasons to believe this but what are yours, is what i meant. Jump, it’s just that the polls continuously over the years say so. If I said why, I’d be guessing. I believe that in the US the Democrats are seen by the people as the better economic managers. I had to work on Saturday, the sixth day in a row. Today we decided to retrieve a special pillow I left in a Chinchilla motel five months ago. It was lodged at my nephew’s place, about 50 minutes west of here at Prenzlau in the Brisbane Valley, near Minden and Marburg, where all the place names are still German. We decided to go duw west over the D’Aguilar Range, via Mt Nebo and Mt Glorious to Wivenhoe Dam. The first lookout is McAfee’s, about 15 mins from here overlooking the Samford Valley. The Brisbane Forest Park starts over our back fence and goes on forever, with glorious rainforest around Mt Glorious. We had a good look at the earthen plugs that would save the Wivenhoe dam wall in a humungous flood if the power was off and the gates wouldn’t open. Wivenhoe has two Sydharbs of water, four if it floods, and if the dam broke about a quarter of a million of us would be swept into Moreton Bay. It’s engineered to withstand a 1 in 100,000 year event in any one year, and having had a good look, I believe it. Pillow retrieved, and as we got home my wife turned on the hot water at the kitchen sink, and a fitting exploded – hot water flooding the kitchen. It took us about an hour, but we’ve isolated the HW system, turned it all off, cleaned up, so we now have cold water until it’s fixed. BTW good luck with that dam overflow release method. Back up is good. Eager readers await advice from our Venezuelologist, interpreting that nation where the Pres has 20% popularity, a Pres election is being held; and the opposition are boycotting the election, some of the leaders from their prison cells. Their at the stage when the Socialist Fruit of the Central Control Tree, after a beautiful flowering to ripening, is laying on the ground, rotting from the bottom up. But hey, that’s what always happens. Here’s their wonderfully written Constitution, as if penned by Bernie Sanders himself. See if there’s anything you don’t like in it. Ambi, our plumber says it was the rotten cheap imported join where the pipe joins the tap. Part of the new kitchen we had installed nearly two years ago. He’s replaced it with good Australian made stuff! Jump you need to listen to David Christian’s The quest to end inequality. It might give you a better idea of Marx and Marxism rather than the bawdlerised version that appears to reside in your head. Seems Marx admired capitalism’s creativity and would not have tried to implement his ideas in Russia in a fit. First, he said, you needed an advanced capitalist economy. Second you needed a vast proletariat. Russia was basically a peasant society and far from advanced by the measures of the day. Then if I were you I’d try Bea Campbell’s Russian communism and the future of social democracy. She was raised a communist and is not afraid of the word “socialism”. Revolutions have mostly been conceptualised as violent male stuff. So, wrong place to begin and wrong way to go about it. Seems as good a time as any to share this critique of Capitalism. The raison d’etre of anyone with a conservative secret decoder ring is the free market. To those Adam Smith fans, the free market is a Hadacol-style, patent medicine, magic elixir that can fix every social, political, fiduciary and meteorological ill known to Man. Yes Sir, just a spoonful of 100 percent pure, non-fat, dolphin-safe, free market capitalism will remedy everything from pernicious racism to grinding poverty to rampant socialism, and leave young and old alike feeling whole, happy and stuffed to the gills with material wealth. Well, I don’t agree. I think the free market is – and always has been – a chimera. I don’t think it has ever existed beyond a fleeting shimmer in the economic sun. 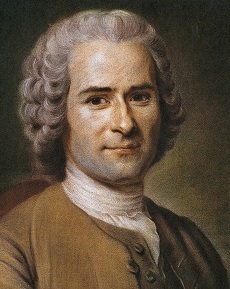 It is antithetical to human nature. As long as there are two or more people competing in any marketplace, at least one of them will seek an advantage over their competition. And, since people are not all equally ingenious, similarly ambitious or identically ethical, one or more of those competitors will succeed in gaining that edge over the others. Once that happens, the advantaged one will seek to solidify their dominance by eliminating their opposite numbers and creating a monopoly over their marketplace. Thus, a stable, free market in which competition creates new products and benefits in perpetuity, is really nothing more than a shadowy smoke dream. “Revolutions have mostly been conceptualised as violent male stuff. Indeed, and out of violence comes death, injury, robbery, injustice and more often than not: a new tyranny. For admirers of black comedy how often does the new tyranny mimic the tyranny it “overthrew”? Because the revolutionists lacked imagination? or lacked confidence? Or were drawn to the battle more for excitement and murder, than by their humanitarian impulses, the “better angels of themselves”? In the Bolshevik case: it was a putsch. *There was already a Parliament, imperfect as it undoubtedly was. *The workers and peasants had already roused themselves out of serflike lethargy. *The Bolsheviks in Petrograd, urged on by an incandescent hyperactive Lenin, seized power. *a Bolshevik coup, not a broad scale revolt of the masses. *Lenin, Trotsky etc. thought they might have only about 100 days in power, but it was still worth having that, to show the world how a tiny group could seize the reins suddenly, in the name of the toiling masses. *Bad luck: Mensheviks, social revolutionaries, democrats, intelligentsia, anarchists, farmers, small business people, Tsarina, ……..
*Later, bad luck: sailors at Kronstadt, very bad luck: “kulaks”; exceptionally bad luck: Old Bolsheviks, Trotskyites etc. … but the heap of corpses isn’t piled as high …. Interesting quote, zoot. The way that’s written, a ‘free market’ carries the seeds of its own fall. Always and unavoidably. Reminds a chap of that Karl M fellow, and his talk of “internal contradictions”. First, he said, you needed an advanced capitalist economy. Second you needed a vast proletariat. Which brings us back to pre-Chávez Venezuela. They’d were well on their way with opening up trade and freeing up markets. But they were way too dependent on oil when the glut occurred, the Marxists blamed “ neoliberals “ ( as usual) for everything. Before Chávez, Venezuela was the top Latin American country in almost every area from literacy to GDP/cap. And might I say climatically as well, still is. Tourism was taking off as well. Then the price controls and the government ownership of everything + oil price surge at the same time gave a sugar hit. Then natural economics bit them so hard in the arse that they are fleeing. When you see the expression on the face of a Venezuelan migrant when they first see an Australian used car yard or the inside of Woolworths it makes an impression. Oh, my Venezuelan friend isn’t a goat herder either, he’s an engineer. Appreciate your thoughts but you did leave out malign foreign influence in Venezualan affairs: Cuban, American, Saudi Arabian, Uncle-Tom-Cobbley- &-All. Let me guess: the welfare and prosperity of the local people was way down the list of priorities of those malign foreign influences – and, just like in Australia, there were hordes of gullible middle-class dills in Venezuela who were eager to rush off and do the bidding of each of those malign foreign influences: left-wing, right-wing or damned chicken-wing. I think their problems have more to do with the what’s-in-it-for-me mob than with the labels on their political and economic structures. Last night the ABC RN program The Philosopher’s Zone had an interesting discussion (Rewilding) on the widespread feeling that society is developing in a way that does not mesh with our basic nature as humans. Apparently there are all sorts of movements that come under the rubric of “primitivism”. Ben Etherington of the School of Humanities and Communication Arts, Western Sydney University, says we need to appreciate and value those remnant groups that have been relatively unaffected by ‘progress’ and see what we can learn from them. At this point that the program ended just where it could have become really useful. Apparently Senator Rhiannon will resign from the Senate in mid-August. Do not lie about your qualifications on Linky. Someone will find you out. Yes, Brian, also heard that ABC RN Philosophers’ Zone discussion on primitivism. Lots worth considering: from dead-ends to bad choices at forks-in-the-road right through to hope for the future. Rewilding sounds like something that would come from a romantic look at the past without seeing some of the problems that are part and parcel of traditional wild societies. It is much the same as the romantic view some people from traditional societies might have of our society. However, someone who has a strong attachment to the wild world cannot afford to be too self righteous. Firstly, “It is much the same as the romantic view some people from traditional societies might have of our society”. That is the heart-&-soul of people traffickers’ marketing schemes: Sell The Dream – no matter how false it is, no matter how dangerous trying to realize it is – just Sell The Dream. So long as stupid – or corrupt – politicians, contractors, journalists, public servants, do-badders and do-gooders continue to ignore outsiders’ views of our society, we will be forever plagued with illegal immigrants and civilian invaders on the one hand and the hysterical “Stop the Boats! !” on the other. Secondly, there is a lot going for some carefully thought out rewilding. The trick is to look at what was done in the past or is done in other places and then to select what would be beneficial, useful and appropriate for us today and what is likely to be so for future generations here. Failure to think things through is what has left us with so much virulent ratbaggery from the 1960s and 1970s. JB: A New Scientist I read a while ago said that there is actually a net return of land from agriculture to the wild going on. Not sure that there was any planning in this return -Suspect that this just farmers going broke, creeping desertification, salination etc. John D,: That’s my guess too. But, just think of the money that’s saved by not having any planning, (pity about all the erosion and the weeds though)..